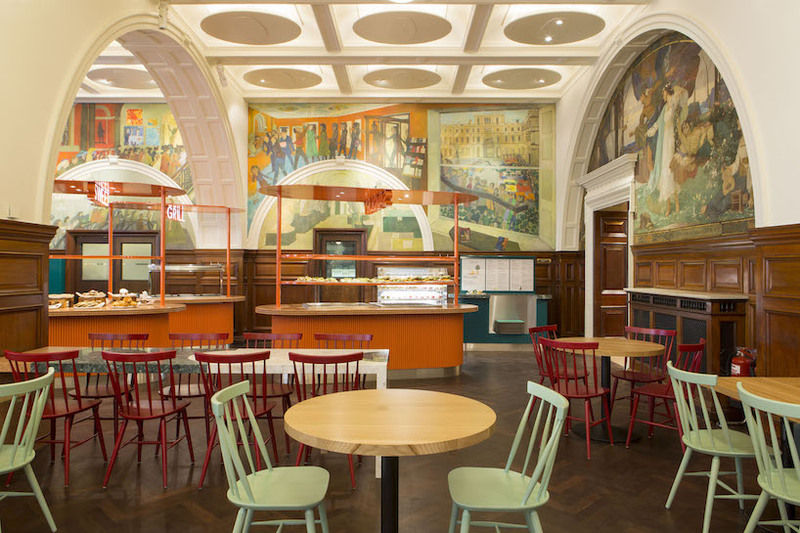 to coincide with the 250th anniversary of the royal academy of arts, london, the RA cafe in the grade II listed burlington house has been reimagined by LOT and transit studio. 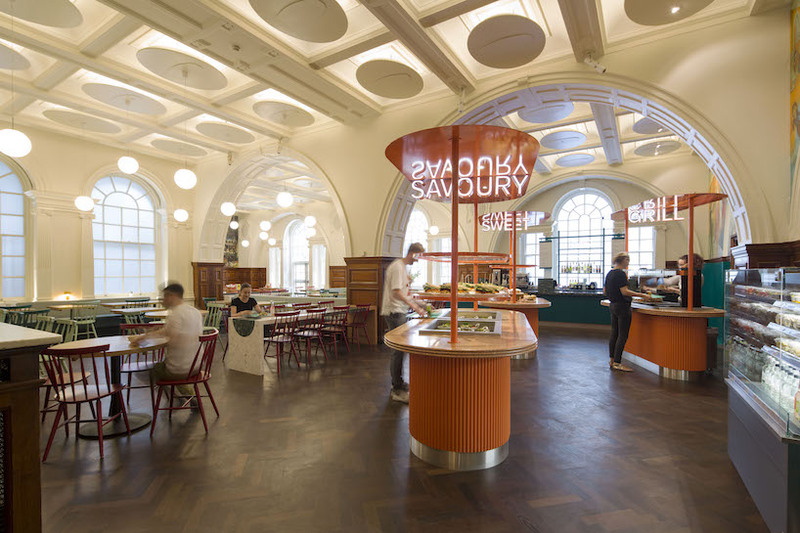 this architectural and interior design collaboration has resulted in a lighter and brighter space inside the royal academy, as well as a new outdoor bar for use in the summer months. it will be occupied by restauranteur oliver peyton, a judge on the BBC’s great british menu TV series. 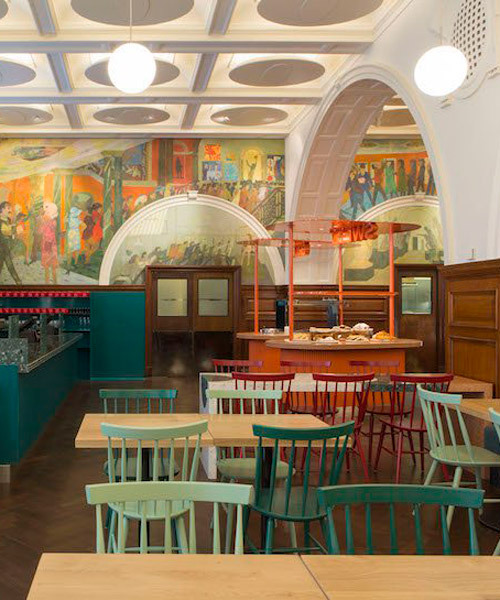 the new café is inspired by the surrounding murals, particularly the bright colors of ‘upstairs and downstairs’ by leonard rosoman royal academician. it has been created it as a warm and welcoming space that has its own identity but feels part of the gallery and art school it sits within. the main space has been opened up to provide better access to a range of service areas and eliminate the queuing issues that plague popular cultural venues. LOT and transit studio have selected a variety of rich and playful materials to use across the space to define an informal setting that will delight the academy visitors while they take a break from the busy galleries. bespoke communal dining tables and ledges create a unified design language across the café and inspire interactions between guests, while a ten-seat table in the lobby – comprised of terrazzo and marble with a circular pattern – can be used for large groups or solo diners. individual island counters have been used to suggest an indoor market, with canopies overhead and integrated illuminated signage, helping with clear wayfinding. the new café is respectful of the heritage of burlington house and so the original mahogany parquet floor has been revived. the lighting has been greatly improved, including LEDs in ceiling coffers, minimal globe lights hanging from the ceiling, up lights highlighting window details and small colorful table lamps dotted around the café. in the royal academy’s annenberg courtyard, a vibrant and playful mix of bright colors and materials appropriate for the summer have been used. 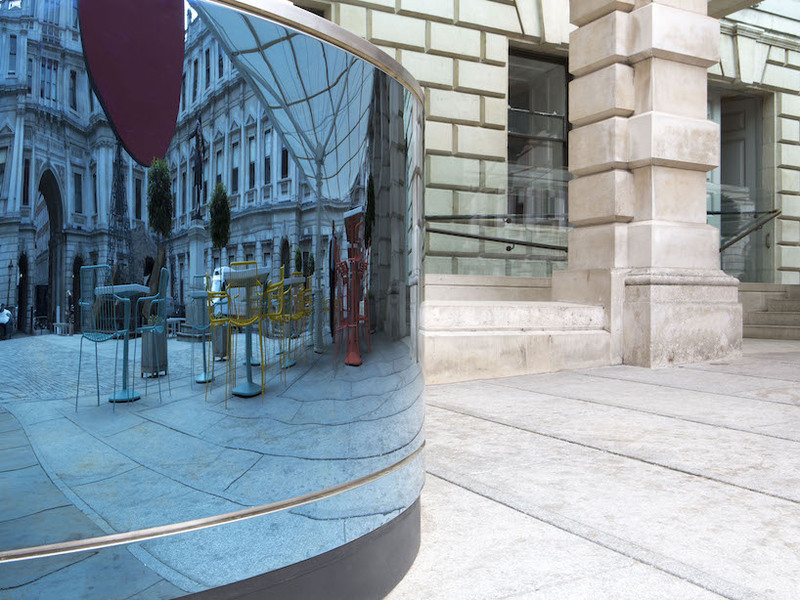 a new cafe kiosk is clad in blue mirror stainless steel and reflects the historic surroundings as well as the ever-changing central sculpture. a large white canopy above acts as protection from the weather and draws attention to the café for visitors new to the gallery, acting as its own signage. splatter enamel table tops, together with pedrali’s ‘nolita’ chairs, reference the activity that takes place within the RA schools.